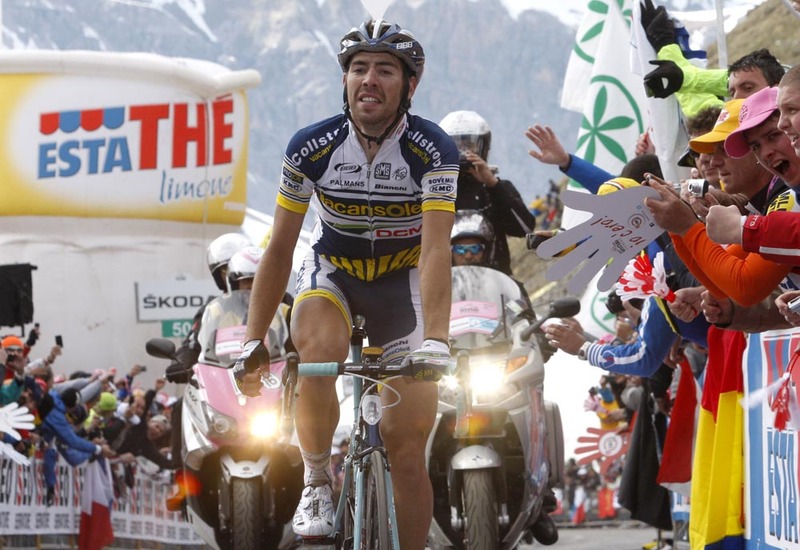 Thomas De Gendt (Vacansoleil) rode himself back into contention for a podium spot at the 2012 Giro d’Italia, conquering the Stelvio to win stage 20 on Saturday. The Belgian finished three minutes and 22 seconds clear of race leader Joaquin Rodriguez (Katusha), who came in fourth behind Damiano Cunego (Lampre-ISD) and Mikel Nieve (Euskaltel-Euskadi). Ryder Hesjedal (Garmin-Barracuda) finished in sixth on the stage and now sits 31 seconds in second spot behind Rodriguez overall. The final mountain day kicked off in Caldes in Trentino this morning with riders nervous. The overall would likely be decided today. The favourites for the overall put men in the key escape of the day, Garmin with Christian Vande Velde, Katusha with Alberto Losada and Liquigas with Damiano Caruso. In total, 13 men went free shortly after 30km in the 219km stage: Vande Velde (Garmin-Barracuda), Caruso (Liquigas-Cannondale), winner of yesterday’s stage, Roman Kreuziger (Astana), Oliver Zaugg (RadioShack-Nissan), Matteo Rabottini (Farnese Vini), Tom Slagter (Rabobank), Branislau Samoilau (Movistar), Matteo Carrara (Vacansoleil), Mathias Frank (BMC Racing Team), Matteo Bono (Lampre – ISD), Andrei Amador (Movistar), Alberto Losada (Katusha), Jose Serpa (Androni Giocattoli) and Stef Clement (Rabobank). They started the key Mortirolo climb with two minutes and 30 seconds. Carrara and Tour of Lombardy winner, Zaugg rode free. Behind, Lampre and Garmin led the pace behind, Peter Stetina leading for Hesjedal. Rodriguez attacked mid-way up when the climb ramped and turned from asphalt to concrete. Hesjedal marked him. Basso trailed off slightly. Also on the climb, Paolo Tiralongo (Astana) and Matteo Bono (Lampre-ISD), who dropped back from the escape crashed. Zaugg led over the top of the Mortirolo. Vande Velde, Caruso, Amador and Serpa trailed. Thomas De Gendt (Vacansoleil-DCM) went clear and went over at 2-28 minutes back. The Rodriguez group at 2-40. De Gendt built on his lead on the descent. He joined with Carrara, Cunego and Losada. The four bridged with Vande Velde, Caruso, Amador and Serpa. De Gendt started the day 5-40 minutes back and threatened the overall lead. At 35km out, Zaugg had 2-07 to the eight and 5-50 to the pink jersey group. Vande Velde drifted back and Stetina re-gained ground to the front. The duo went to work for Hesjedal to control De Gendt. Zaugg led with four others in the first kilometres of Stelvio, 22.4 kilometres out. Stetina and Vande Velde pulled the group along four minutes behind. De Gendt proved strongest. He moved free, left Cunego with Nieve and, at 10km to go, led with nearly five minutes – in third overall on the virtual GC and threatening the lead. Although De Gendt’s time advantage over the other GC contenders was reduced by the finish line, he still gained enough time to move up to fourth overall ahead of Sunday’s final time trial in Milan. Mark Cavendish (Sky) has lost out on the points classification after Rodriguez finished in fourth spot on the stage, overtaking the Manxman by just one point.